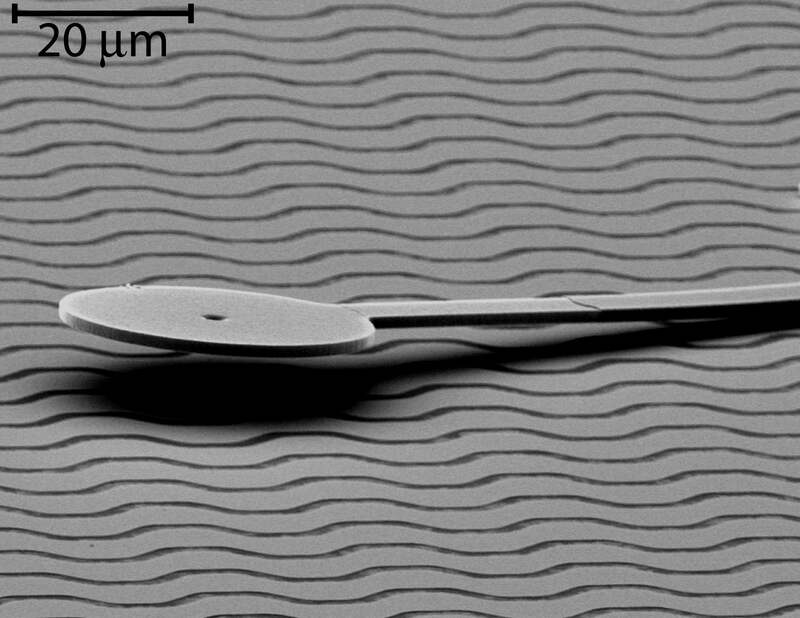 These MicroRobots are one tenth the thickness of human hair, about as wide as a hair, and shorter than the sharp point of a thumb tack, yet they can be remotely controlled to navigate anywhere on a surface. Integrated in this small package are a wireless power and control signal receiver, walking actuator, steering actuator, and on-board state memory. An interdiscplinary team of engineers and computer scientists at Dartmouth have made the world's smallest untethered mobile robots. These robots can be remote controlled to walk anywhere on a special surface. The robots move forward with an inch-worm like gait, bending one step at a time. They turn by snapping down a foot on the end of a steering arm; motion then pivots arount the fixed foot. An operator can control forward motion and turning with a sequence of commands through a wireless tramsmission that also powers the motion. There is a potential for very precise position control; the average step size is a minute 12nm, about .01% of a hair diameter. However, the robots take over ten thousand steps a second and continue their motion for over half an hour with no sign of fatigue, with net motion of over one foot in length. That represents over 30 million steps; a human taking that many steps would go over half way around the world. Micro Robot Dance choreographed to the Blue Danube waltz (Strauss), demonstrates independent control of two of our microrobots. These microrobots were all designed at Dartmouth using Thayer School tools and techniques, fabricated in part by a foundary service with all remaining fabrication, tuning, and operation in the Thayer School Microengineering Lab. All videos of these microrobots have been recorded at Thayer School of Engineering. FIGURE TO THE RIGHT: This SEM image shows the untethered scratch drive actuator (A) used for propulsion, and the cantilevered steering arm (B) which can be lowered to provide a turning pivot. The wavey lines the robot sits on are the insulated interdigitated electrode array which transmits power and control signals to the robot. Movie of robot tracing a Dartmouth "D". In this movie, the dots and text are overlays added to the video after the fact. The underlying video of the robot motion is unedited except that it is shown twice actual speed. The curved portion utilizes both turning and straight motion gaits. The robot is 250 microns long and 10 microns high. Also in the popular press, e.g. PC Magazine December 6, 2005, page 26. Utilizes surface micromachining (MEMS) with stress engineering to produce out-of-plane curl. turning: Propulsion and Turning Arm both deployed. Operation demonstrated at 16kHz (not an intrinsic speed limit). Teleoperation alows motion anywhere on a plane. 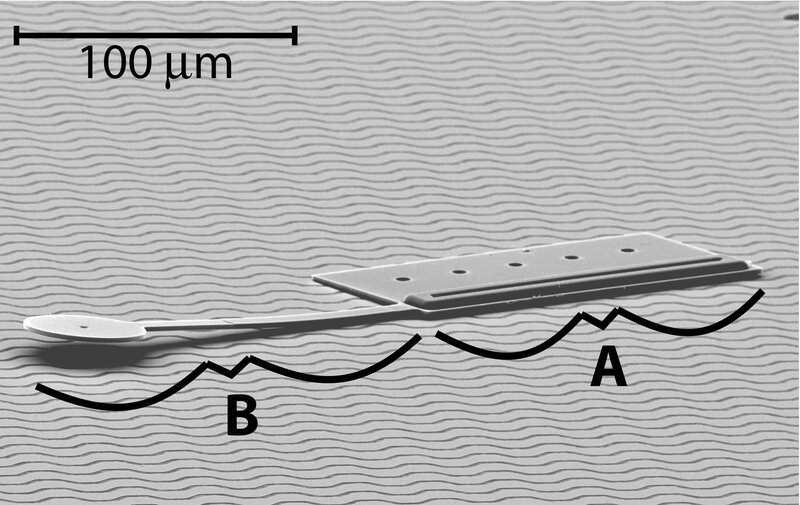 Moves on an insulated substrate with submerged interdigitated electrodes. Control is one-wire (plus ground) with four level logic, and is independent of robot position or orientation on substrate surface. In the Dartmouth Thayer Microengineering Laboratory. Craig McGray*: the Dartmouth graduate student who did most of the initial lab work in the Dartmouth Thayer Microengineering Laboratory on the single untethered MEMS robots. [*now at the National Institute of Standards and Technology (NIST) in Gaithersburg, Md.]. Richard Rohl*: a Dartmouth summer intern who designed a vacuum micro-probe to facilitate moving and testing of these robots on multiple surfaces [*work done at Dartmouth Thayer School while on leave from Cornell University as part of a NSF sponsored Research Research Experience for Undergraduates (REU program)]. Shara Feld and Ellen Pettigrew: Dartmouth undergraduates who have worked on larger (1mm) scale versions of these robots and related devices. Lead on electromechanical design, robot fabrication/processing, robot testing, and microscopy. The work was funded in part by the Department of Homeland Security, Office of Domestic Preparedness through Dartmouth's Institute for Security Technology Studies (ISTS), and by the Thayer School of Engineering.